e-Rocks is about mineral collecting online. Most importantly this is a friendly place and we work hard on a personal level to help customers enjoy using our site. The site is managed 24/7 and Admin is always on hand to help. Our community offers a daily digest of minerals for collectors with interests in all areas of mineralogy, plus thousands of pages of information for reference and research. e-Rocks is also interactive, and we want people to use our site for sharing photos, blogs, messages, items of interest that build on what we already have. Built from scratch we have extended our inventory database to include non sale items, archive and reference information in different views. This can help your collecting in many ways. Item details, photographs, status, purchase/provenance, pricing and storage all mangaged within your own secure personalised private portal. Additional to physical storage you can organise and display everything online by classification, by location, or by assignment to groups with infinite tagging. Bring things back in list views, galleries, pages or groups. APIs Importers and intuitive upload systems allow you share/upload collections en masse or items individually, quickly and accurately. Onscreen and downloadable reports for you to support other electronic catalogues and paper systems. Either download printed labels from our templates or CSV options for merge printing. We have created a range of Apps for posting and sharing items/wants across social networks and forum sites. You can also drive your own e-Rocks own web pages, blog site either within e-Rocks or via your own website or Facebook page. We also have created a group and forum function that will interface directly with Facebook group. You can add other items to your catalogue that are not mineral specimens, depending on what these are we will provide database categories and form structures to integrate any collectible you have. Thinking specifically of meteorites, gemstones and fossils these would be integrated within your catalogue and can be shared across other media as needed. We first had the idea for e-Rocks in 2001, however we started e-Rocks in January 2006 as a mineral auction site. Initially we were a few collectors/small dealers who wanted to work together to provide something different to other mineral market places, and run by collectors for collectors. Today our auctions have a core of over 70 sellers Worldwide contributing to an inventory that has recently exceeded 215,000 listings. Our customer base is equally global with over 7,500 registered users. The site is administrated and owned by Thames Valley Minerals and we been operational as mineral dealers since 2001; interested in collecting for a lot longer! ThamesValley Minerals offers minerals through e-Rocks under the TVM Auctions brand, to date we have sold over 25,000 minerals worldwide - there are quite a few of our labels out there! 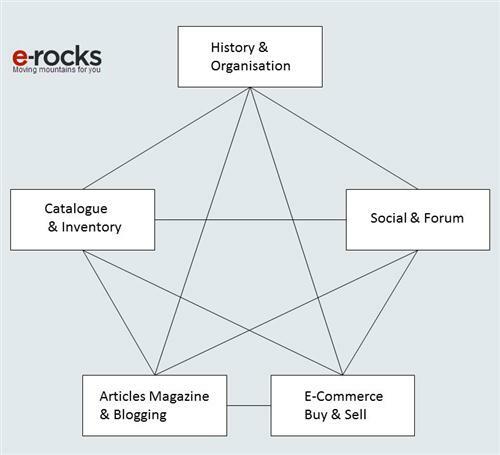 e-Rocks is actually 5 websites, each with its own job and connections to other websites and media outside. The picture shows our internal structure and how everything is wired together so that we can create just about any "mineral" option a person could want. With direct connections outside (in the business known as APIs) we can ask other sites like Google eBay Paypal or Facebook for information and also post back. A good example of this is our geolocation - we give Google a location - Google sends us the map. This principle works internally - for example if you create a blog post, you can tell the website to connect to a specific Specimen, Mineral Data, Location, Collection or Group. If for example the Location has already been connected within a History or Organisation, then that information gets shown to the first connection. We can create millions of these connections inside and outside of e-Rocks. To the user the options are infinite and all easy to do (undo) on the click of a mouse. Do you have a collection or minerals to dispose of?